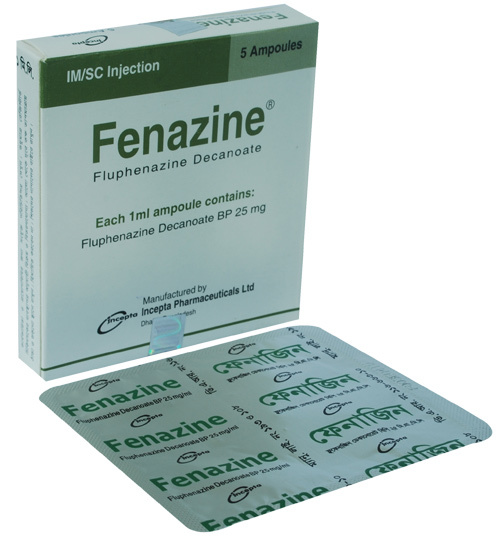 Fenazine IM/SC injection: Each 1 ml ampoule contains sterile 25 mg of Fluphenazine Decanoate. Fluphenazine Decanoate is a phenothiazine derivative. It is a highly potent antipsychotic agent with a markedly extended duration of action, available for intramuscular or subcutaneous administration. The esterification of Fluphenazine with decanoic acid markedly prolongs the drug\'s duration of effect without reducing its activity.Fluphenazine blocks postsynaptic dopamine D1 and D2 receptors in the mesolimbic system and decreases the release of hypothalamic and hypophyseal hormones. It produces calmness and reduces aggressiveness with disappearance of hallucinations and delusions. Fluphenazine Decanoate by deep intramuscular injection into the gluteal muscle, test dose 12.5 mg (6.25 mg in elderly), then after 4-7 days 12.5-100 mg repeated at intervals of 14-35 days, adjusted according to response; it is not recommended for children. The side effects include tardive dyskinesia, sedation, mental confusion; hypotension; hyperprolactinaemia leading to galactorrhoea and amenorrhoea in women; loss of libido, impotence and sterility in males. Also include allergic reactions, cholestatic jaundice, corneal and lens deposists, skin pigmentation. Other potential adverse reactions are agranulocytosis; neuroleptic syndrome. Special precaution should be practiced in presence of convulsive disorders; hepatic, renal, cerebrovascular, respiratory and cardiovascular diseases. Also precaution should be observed in case of phenochromocytoma; bone marrow suppression; elderly or debilitated patients. The safety for the use of Fluphenazine decanoate during pregnancy has not yet been established; therefore the possible hazards should be weighed against the potential benefits when administering this drug to pregnant patients.